Zapatista travel program to paint mural at a Zapatista school. 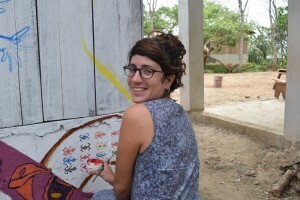 Trip #129 summary description: Collectively paint school-size mural on an autonomous Mayan schools in Chiapas, Mexico! Delegates will live and learn in Zapatista autonomous territory while painting alongside our gracious hosts. Necessary qualifications are: respect for indigenous leadership and a cooperative spirit. (Good humor also helps.) We will be living in the conditions of the host community: cooking over open fires, sleeping in rustic accomodations, and waking with the sun. 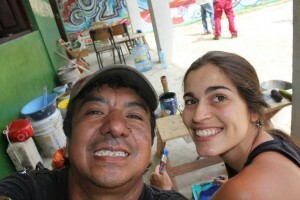 No special artistic nor language skills are required to participate – but you’ll learn a lot from our guest muralists! We take time to learn about the Zapatista movement through readings and video presentations, but conversations with Zapatistas themselves are the greatest source of knowledge. Delegates will have opportunities for face-to-face discussions with the individuals and groups who challenge the globalization of planetary exploitation every day in their struggle for autonomous education, health, agroecology, and indigenous governance. Participants are urged to seek support, participation, or even hands-on artwork with organizations from their own homes. We look forward to sharing the experience with you! Begin your application. 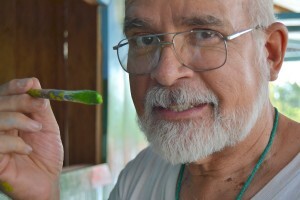 You may sign up for one or two weeks of mural painting. Trip #129 objective: Working with experienced team of Mexican and US muralists and other artists, the team will work and paint with students, teachers, and parents at a school selected by the Zapatista civilian Good Government Board (JBG) and the regional education committee. Participants will gain an in-depth understanding of the broader Zapatista movement while directly experiencing contemporary realities of the autonomous, indigenous Mayan communities of Chiapas, Mexico. Schools for Chiapas supported the construction of this elementary school and it is still lacking a mural. Cost of trip #129: The base cost of this trip will be two weeks of the minimum wage of your state or country. (For example the minimum wage in California, USA is $10.00 usd X 80 hours of work = $800 usd. total cost. http://time.com/4274938/minimum-wage-state-map/) This cost/fee will provide you with food, rustic housing, ground transportation from our first night hotel in San Cristobal de las Casas to the worksite and then back to San Cristobal de las Casas, translations, study materials, paint and paint supplies, plus a significant donation to the autonomous communities and at least one guiding mural artist/teacher. No air travel, airport transfers, nor insurance of any kind is included; you must make these arrangements on your own. This unique and gripping image was painted during a Schools for Chiapas mural delegation at a remote Zapatista secondary school in the tropical zone of Chiapas, Mexico. The delegation begins on Sunday, July 7, 2019 5pm in the highlands tourist city of San Cristobal de las Casas, starting with a general orientation and dinner. 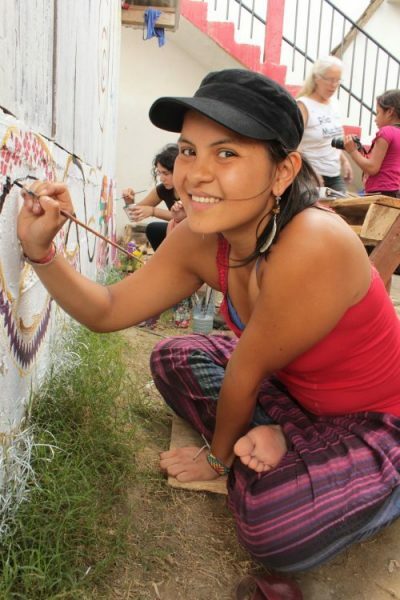 The next morning (Monday, July 8, 2019) we will travel to a Zapatista school somewhere in rural Chiapas, Mexico where we will spend the week painting along with students, teachers, and parents. We may have the opportunity to visit a Zapatista caracol/center. The delegation ends at noon on Saturday, July 13 in the highland city of San Cristobal de las Casas, Chiapas, Mexico. Three important Zapatista figures center this mural on a rural secondary school in Chiapas, Mexico. Transportation: Buses arrive in San Cristobal de las Casas from all over Mexico. For those of you who are arranging flights, the best way to travel is to fly into and depart from Tuxtla Gutierrez (TGZ). How you arrive and how your return home is your decision and must be arranged independently. Meet fascinating folks from all corners of the globe! For the return trip, you will be taking a taxi, bus or combi (at your own expense) about an hour from San Cristobal de las Casa to the Tuxtla Gutierrez (TGZ) airport. Again, you must make these travel arrangements on your own. This mural was created in the spring of 2016 as part a collaboration between the students and educators at one small Zapatista school and a group of international and Mexican people-of-conscience including students from the University of Wisconsin, Parkside. This mural painting caravan was hosted by the Zapatista Education Commission of the Caracol of Morelia and organized by Schools for Chiapas. Everybody inevitably finds their favorite color! Plenty of room to paint for everyone!